Online sales close at noon, CASH at the door after that! It is Future Funk time! Music Night On Jupiter is excited to be working with Michael Canton to bring New Orleans's own Water Seed back to Pittsburgh. The last time this crew was in town, they played in front of thousands of fans in Schenley Plaza. The Parkway Theater is not large, so grab your tickets soon! Tickets are $15 in advance or at the door. Known for their high-energy marathon performances, Water Seed has commanded some of the most impressive stages across the country. Their latest 2 projects have debut in the top 40 on the iTunes Jazz and R and B charts and their relentless touring schedule continues to gain momentum keeping the band’s diverse fan base wanting more with every stop. Powered by a seamless rhythm section. Enforced by an agile horn section. Top with a demanding vocal performance and front line, Water Seed will funk any audience right out of their seats. 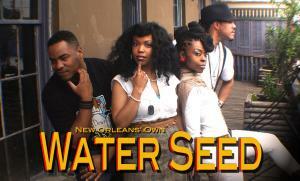 Water Seed - Funktimus Prime (Grammy Memphis Chapter Mixer) from lou hill on Vimeo.